INCHEON, South Korea — The U.S. on Wednesday urged China to press North Korea to halt provocative actions against South Korea, after an artillery attack on the South that the Obama administration called a “premeditated” violation of the truce that ended the Korean War. U.N. Secretary-General Ban Ki-moon called the shelling of the island near the two nations’ disputed maritime border one of the “gravest incidents” since the Korean War. South Korean troops remained on high alert. In Washington, President Barack Obama pledged to “stand shoulder to shoulder” with Seoul. The U.S. has more than 28,000 troops in South Korea to guard against North Korean aggression, a legacy of the bitter three-year conflict that ended in a truce, not a peace treaty, in 1953. Seoul and Washington reaffirmed plans to hold joint military exercises later this week in the Yellow Sea, just 70 miles south of Yeonpyeong. The White House said the aircraft carrier USS George Washington would take part. About 10 homes suffered direct hits and 30 were destroyed in the midafternoon barrage, according to a local official who spoke by telephone from the island just seven miles from the North Korean shore. About 1,700 civilians live on Yeonpyeong alongside South Korean troops stationed there. The shower of artillery from North Korea was the first to strike a civilian population. In addition to the two marines killed, the bodies of two men, believed in their 60s, were pulled from a destroyed construction site, the coast guard said. At least 18 people — most of them troops — were injured. Officials in Seoul said there could be considerable North Korean casualties. North Korea’s main Rodong Sinmun newspaper published a military statement accusing South Korea of triggering the exchange, but did not mention any casualties. The skirmish began after North Korea warned the South to stop carrying out military drills near their sea border, South Korean officials said. When Seoul refused and fired artillery into disputed waters — away from the North Korean shore — the North retaliated by shelling Yeonpyeong. The Obama administration urged China to press North Korea to halt provocative action. Artillery and gunfire break out sporadically along the land and maritime borders dividing the two Koreas, and have brought deadly exchanges four times since 1999. In March, North Korea was accused of sinking a South Korean warship, the Cheonan, killing 46 sailors. Pyongyang has denied responsibility. What we are seeing is more likely the beginning of a hardline policy shift, the likes of which the world has not seen since the Stalinist regime’s last power succession, when the Dear Leader, Kim Jong-il, took the reins from his father, Kim Il-sung. Indeed, the shelling of Yeonpyeong took place in the same waters as the sinking of the South Korean military vessel, the Cheonan, this March, which killed 46 soldiers. News also emerged this past weekend, from two returning American delegations, that the nuclear-armed regime has built a secret second uranium-enrichment plant. Many analysts expect the North Korean military to proceed with its third nuclear test any day now. Such hardening aggression against the South suggests that the Dear Leader’s recently anointed successor, his baby-faced third son, Kim Jong-un, has already begun the process of cementing his power base in the military-first society. The recent escalation in fact is analogous to the deadly antics of Kim Jong-il in his early years as ruler-in-waiting. In 1983, he was thought to have orchestrated the attempted assassination of the South Korean president, who was traveling in Burma at the time. The failed attempt killed 21 people, including several members of the South Korean cabinet. This throwback to the regime’s Cold War antics marks the return of the North’s fire-breathing generals, who have increasingly cemented their control over the younger Kim. Since last year, when succession rumors began trickling out, military branches of the government, such as the National Defense Commission and the Korean People’s Army, have been issuing ever more bellicose statements, instead of official remarks being sent out by the relatively moderate Foreign Ministry. It has been rare until now for soldiers — rather than diplomats — to be the ones hurling the regime’s signature tirades against the West and South Korea. Though the latest attack may seem like the sort of saber-rattling the North routinely uses to get Washington or Seoul’s attention, the relatively rational moderates in Pyongyang who have perfected this tactic are already out of the picture. The key decision makers are now the hawkish generals, a faction that the Dear Leader has become increasingly dependent on. 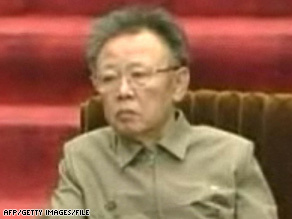 Image of Kim Jong-Il on North Korean television, April 9, 2009. The personality profile yielded by the MIDC was analyzed on the basis of interpretive guidelines provided in the MIDC and MillonIndex of Personality Styles manuals. Kim’s primary personality patterns were found to be Ambitious/self-serving (narcissistic) and Outgoing/gregarious (histrionic), with a secondary Dauntless/dissenting (antisocial) pattern. In addition, the personality profile contained subsidiary but relatively unremarkable Dominant/asserting (sadistic), Contentious/resolute (passive-aggressive), and Erratic/unstable (borderline) features. Characteristically, these personalities fabricate stories to enhance their worth andleave behind a trail of broken promises and outrageous acts, including swindling, sexual indiscretions, pathological lying, and fraud. However, the hedonistic narcissist’s disregard for truth and talents for exploitation and deception are rarely hostile or malicious in intent; fundamentally, they are not malevolent. Having never learned to restrain their fantasies, and unconcerned with matters of social integrity, hedonistic narcissists maintain their beguiling ways through deception, fraud, lying, and by charming others through craft and wit. Instead of applying their talents toward the goals of tangible achievements and genuine relationships, they selfishly devote their energies to the construction of intricate lies, cleverly exploiting others and slyly extracting from them what they believe is their due. The major political implications of the study are the following: First, although North Korea’s military capability undeniably poses a legitimate threat to regional stability, any claim by Kim Jong-Il with regard to his military capabilities are not to be taken at face value, but should be called into question andverified; second, Kim is relatively conflict averse and unlikely to employ military force without provocation; and third, Kim is relatively open to influence by carefully crafted diplomatic and economic means subjectively perceived as bolstering his self-serving ambitions. In the event Kim’s medical condition should color his pre-existing, premorbid personality with paranoid ideation or delusional thinking, he is likely to become increasingly mistrustful and vigilant; irritable and thin-skinned (hypersensitive to perceived slights and easily enraged by narcissistic injury); defiant, hostile, belligerent, and vengeful (determined to “balance the books” with respect to what he perceives as past wrongs); dichotomous (“us versus them” social perception); insular (impervious to corrective action in response to sound advice and new information); self-righteous (arrogant and acting with a sense of entitlement); and self-justifying (viewing his own transgressions either as defensive necessity or as “payback” for the malevolence or wrongs of others). North Korea’s November 25, 2010 artillery barrage of Yeonpyeong island, in conjunction with the sinking of the South Korean warship Cheonan on March 26, 2010, most likely is indicative of a hardline policy shift in North Korea coinciding with the military leadership cementing its control over Kim Jong-il’s successor, Kim Jong-un. One year ago today, I provided my weekly report of U.S. military deaths in Iraq and Afghanistan. Marine Lance Cpl. Nicholas J. Hand, 20, Kansas City, Mo., died Nov. 22, 2009 in Garmsir, Afghanistan, of wounds sustained from small-arms fire while supporting combat operations in Helmand province. He was assigned to 2nd Battalion, 2nd Marine Regiment, 2nd Marine Division, II Marine Expeditionary Force, Camp Lejeune, N.C.
Two years ago today, on Nov. 24, 2008, I reported that a female suicide bomber had blown herself up near an entrance to the U.S.-protected Green Zone, while a bomb tore through a minibus carrying Iraqi government employees in separate attacks in Iraq, killing at least 20 people.